San Jamar has everything you'll need to keep your bar running smoothly. 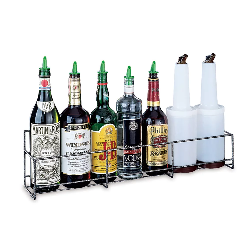 Tap plugs, condiment trays, garnish trays, speed racks, or the San Jamar Bar Caddy, San Jamar products are designed to assist the bartender in keeping a clean and organized space to speed up service, increase output, and keep ingredients sanitary. Once your glasses are sparkling clean, your liquors have been licensed and organized, and you've hired bartenders to serve drinks complete with every garnish, twist, or accent customers could think of, it's time to think about where you'll keep cocktail onions before they have a cocktail to go on. Instead of reaching into an undercounter refrigerator or running back to the kitchen when you need add the final touch to a mixed drink, consider adding some of San Jamar's efficient solutions to your bar operation. 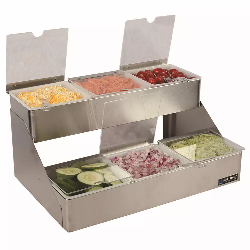 The simplest method for storing your garnishes and toppings, a San Jamar garnish tray provides clean compartments to organize and serve garnishes. These trays save counter space, which is always at a premium, and quicken serving times for drinks and food. San Jamar offers garnish trays in a variety of sizes and shapes so you can find one that fits your needs. San Jamar also makes larger versions of garnish trays for establishments that want to serve food or more elaborate drinks. 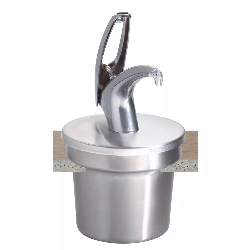 These condiment dispensers offer multiple compartments of varying size for storing drink garnishes, sandwich toppings, condiment packets, and other meal components you want readily available. Consider products with clear lids so your servers can see what they're reaching for and know when compartments need refilling. 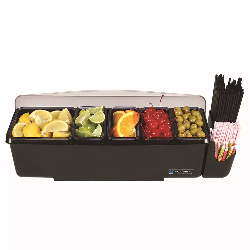 San Jamar chilled garnish trays enable bartenders to use fresh, safely stored garnishes. By placing ice beneath the storage compartments, operators can keep garnishes cool, fresh, and easily available without refrigeration. 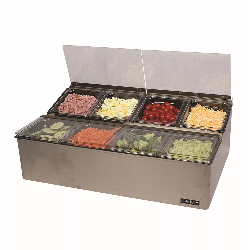 Chilled trays also come in a variety of sizes, so you can match the tray to the range of garnish or toppings you wish to offer. In addition to garnishes and condiments, every bar needs readily available ice. 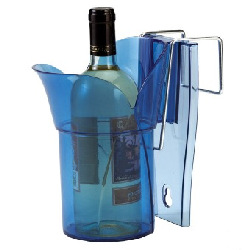 San Jamar offers an array of scoops and totes to keep your guests' drinks cool and refreshing. 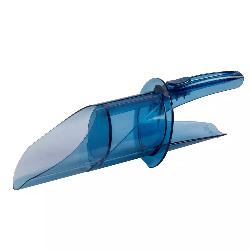 Saf-T-Scoops keep bartenders from scraping knuckles on the ice or cooler, prevent contamination, and store and dispense ice safely and efficiently. San Jamar's Saf-T-Scoop has an ergonomic handle, domed scoop design, and protective guard, while being NSF certified for safety. These qualities give operators a sure grip and accurate distribution while protecting against unsafe knuckle and thumb contact with ice. Bartenders may have their hands in a dozen different tasks, but Saf-T-Scoop keeps those hands out of your customer's drinks. Keep your bottles chilled without mess with a San Jamar Bottle Guardian. The Bottle Guardian is easily mounted inside your ice station to keep bottles cool without allowing any cross-contamination between ice and bottle. The Bottle Guardian protects your ice from unwanted debris and bacteria without a hassle. The Saf-T-Ice Tote from San Jamar is a BPA-free ice tote designed for ease of use. 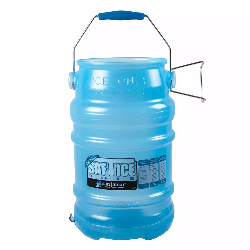 With a patented hanger that enables faster and easier filling, a special grip designed to be safer to carry, and an option for a Snap-Tight lid, San Jamar's ice tote is sure to do the job. The NSF-certified totes are safe and easy to clean. Pump dispensers mean adding syrups to drinks and ketchup to fries is more convenient. San Jamar dispensers enable the bartender to dispense a precise amount of additive to a drink or dish with one pump, saving time and increasing service speed. 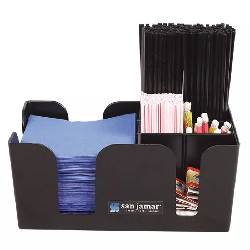 San Jamar also offers a gourmet bar caddy to organize napkins, straws, condiment packets, and other items. San Jamar dispensers come in a range of sizes, functions, and makes. The company's trademarked Frontline pumps feature a no-drip design to keep your countertop clean and condiments under control. These pumps can dispense condiments from gallon jars, #10 cans, #10 jars, or from a directly poured receptacle. With their Soft Touch pumps, these devices deliver a smooth and consistent one ounce portion of sauces, dressings, or syrups with each use. Like a golf caddy, the Bar Caddy holds what you need until you need it. 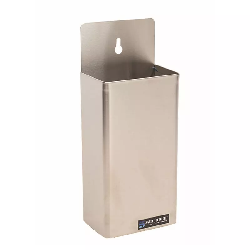 Always readily at hand, the Bar Caddy is designed to dispense straws, napkins, and condiment packets, and the Bar Caddy's sturdy plastic construction ensures a convenient, cost-effective addition to any countertop. The aptly named Speed Rack hastens drink slinging at a busy bar and ensures the bottles you need most are the ones closest to you. San Jamar also offers some miscellaneous products to keep your taps clean and give your countertop traction. Speed racks are a versatile add-on for any bar. With adjustable hanger straps, these racks can be installed in the most useful spot to the bartender and stock anywhere from 6 to 20 quart or liter bottles. Speed racks come as single or double rows, so you can expand capacity as needed. A speed rack enables bartenders to whip up a customer's favorite in a blink. San Jamar's Kleen Plugs fit into beer taps and liquor bottles to keep them sanitary overnight. Prevent critters from crawling into taps searching for the last drops of wheaty beer, or replace lost caps with high-impact plastic plugs. Kleen Plugs keep out pests, dust, and other contaminants, limiting waste from contamination. 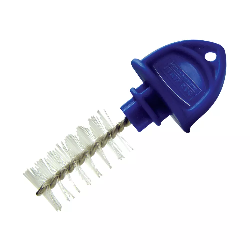 Offered in packs of 5 or 50, Kleen Plugs are a handy answer to some tricky barkeeping questions. San Jamar offers several tools to ease running your bar, and some accoutrements to ease using those tools. Shop for speed rack hanger straps, gourmet bottle cap catchers, and non-slip bar mats. The bottle cap catcher mounts easily underneath a bottle opener to catch caps and keep the bar area organized.